This variety of buffalo has a softer texture than the Common Buffalo, however is still slightly coarser than the other Buffalo (or other Buffalo grasses) that we stock. Shademaster Soft Leaf Buffalo is quite hard wearing, ideal for high traffic areas. It is also non-allergenic as well as being 70% shade tolerant. However it will turn purple if exposed to colder conditions, particularly through very severe frost conditions. 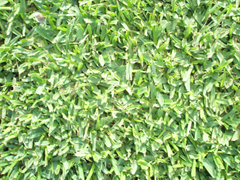 Shademaster Buffalo, is a hard wearing turf variety.